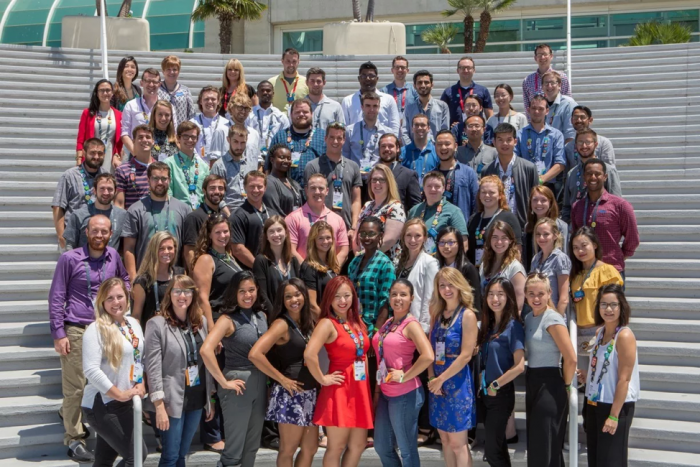 This spotlight article features a guest post from Morgan Moe, at the University of Calgary who recently attended the Esri User Conference in San Diego in July as a volunteer through the Esri Student Assistantship Program. My name is Morgan Moe and I am Geomatics Engineering Student at the University of Calgary. After taking my first Geographic Information Systems (GIS) course I was eager to learn more about it and how I could apply it to real-world problems. As with everything, my search started online where I discovered the plethora of resources that Esri offers. I quickly decided that attending the 2017 Esri User Conference was the best way to further my awareness in the world of GIS. This is when I learned about the Esri Student Assistantship Program. This program selects 60 students from around the world to attend the annual Esri User Conference in San Diego. Being a Student Assistant, you receive full registration to the conference, hotel accommodation, and a per diem allowance for meals. You are required to help with a variety of conference tasks such as registration, logistics, technical workshops, and running the Esri Store. The best part is that while you get to work with a great group of people for the first half the day, the second half is at your disposal for attending inspiring talks and informative technical workshops. Going Mobile: A lot of talk at this year’s user conference centered around the use of Esri’s Mobile Applications for collecting and using information. These Apps include Survey123, Explorer, and Collector. Survey123 is a form-based application that makes creating, sharing, and analyzing survey results a breeze while Explorer allows you to take your maps on the road. Collector is the real powerhouse, in my opinion, enabling a distributed workforce to easily collect geospatial information in the field and send it back to the office for further processing. The application works both online and offline, and on either iOS, Windows, or Android. It even integrates with external receivers such as the Trimble Catalyst. The Trimble Catalyst is a software-defined GNSS receiver that works seamlessly with its own app or the Collector for ArcGIS app. The receiver is small, light, power-efficient and can offer scalable accuracies from 1cm to 100cm depending on your needs and subscription. Python: As an engineering student I was keen to learn what programming languages are being used the most within the GIS world to best prepare myself for future employment. Python, without a doubt, was one of the most talked about programming languages at the User Conference. There were numerous ‘Introduction’ and ‘Beyond the Basics’ technical workshops offered throughout the week and I also learned that Esri also offers an online Python for Everyone course for free. If you’re interested in GIS, there is no reason not to check it out! Developer Tools: A real highlight for me was some of the technical sessions targeted towards developers. Story Maps continued to make a splash at this year’s user conference and while I have played around with creating basic story maps, the developer sessions taught me the skills I needed to download, customize and deploy the Story Map applications on my own web servers. I also learned how to go about creating iOS and Android applications with ease using AppStudio for ArcGIS. This tool allows GIS professionals, even with little or no programming experience, to transform their maps into mobile applications and deploy them in the leading App Stores. I would highly encourage any students interested in GIS to apply for the Esri Student Assistantship Program. Not only will you learn an outstanding amount about leading GIS technology and how to use it, but you will also meet incredible people from all around the world. These professional connections will inspire your own career and open opportunities you may not even know exist.